WH Claims Trump Has No Problem With Releasing Full Mueller Report: That Decision's In The Hands Of The AG - Joe.My.God. White House press secretary Sarah Huckabee Sanders said Monday that President Trump doesn’t have “any problem” with special counsel Robert Mueller’s full report being released. 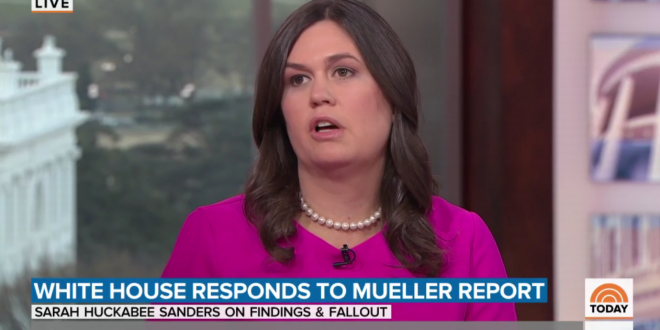 “I don’t think the president has any problem with it,” Sanders said on NBC News’s “Today Show” when asked about Trump supporting the release of the report. We have a feeling she already knows Barr will attempt to block the full report’s release. As you’ll see in the second clip below, Sanders refuses to acknowledge the “does not exonerate” portion of Mueller’s report.